In 2016, ALLFORYOU awarded an exclusive contract to Lee Sang Woo to be their model partnering Kim So Yeon! 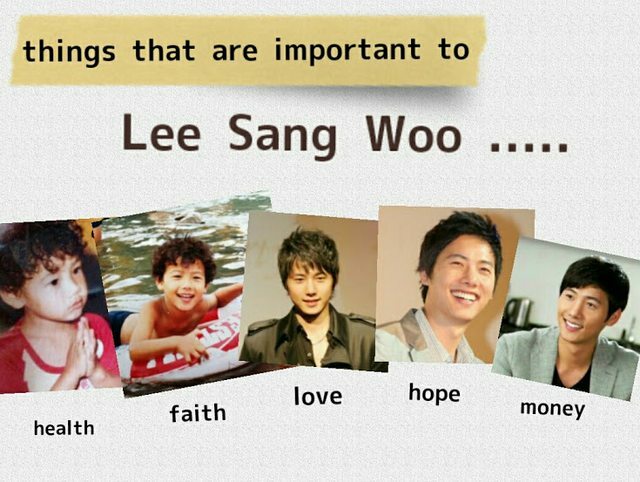 This is what ALLFORYOU said: "clean, warm charm of Lee Sang Woo …. matches very well for ALLFORYOU concept and emotions of lifestyle casual wear". This is through their experience with him working on “All About My Mom” (source). Actors Lee Sang Woo and Kim So Yeon were photographed modeling the 2016 spring collection for the sports casual brand “All For You”! The two showed off different style concepts for a lifestyle look and a spots style look. 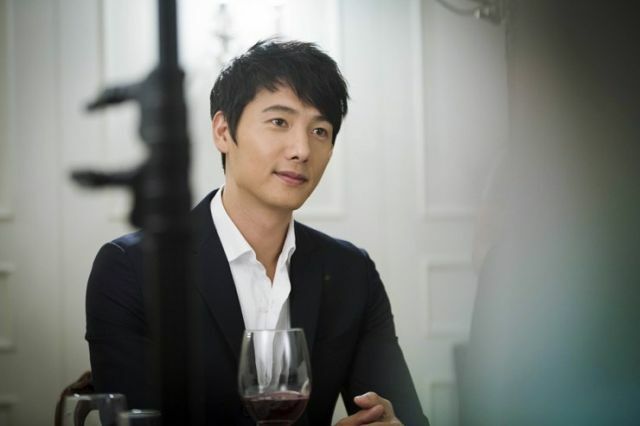 For the first set of photos, Lee Sang Woo models clothing targeted for men in their thirties and forties with his mature look (source). In his office there is pond and he takes care of it. In the pond lived 3 sharks and 2 lobsters. He likes them all. The sharks do not have teeth and were bitten to death by the lobsters. 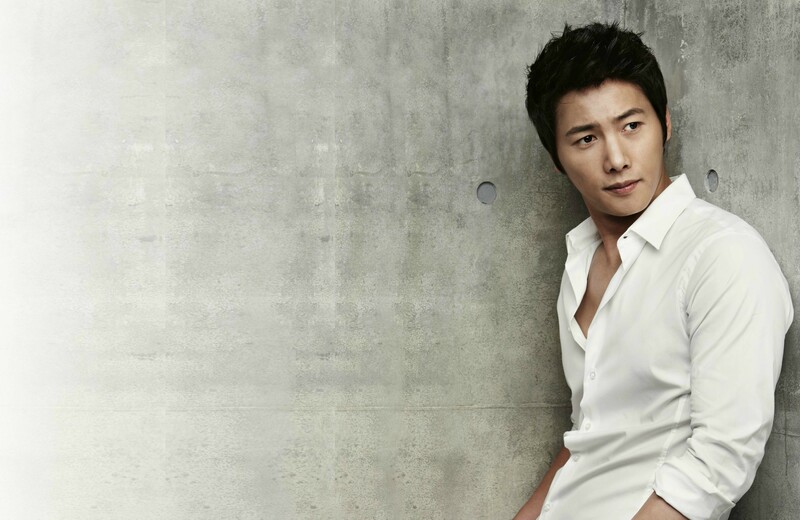 Lee Sang Woo was concerned over the survival of the only shark left in the pond. This has motivated him to compose a song for the only surviving shark... "How is the shark going to live/survive?". I won't get to see the 3 sharks and 2 lobsters anymore. Someone dropped a varnish container while cleaning the pond. Sensitive shark and lobsters turned cold on the spot. Goodbye sharks... I won't get to see you anymore.... goodbye sharks. Later, he kept a gold fish in the pond instead. 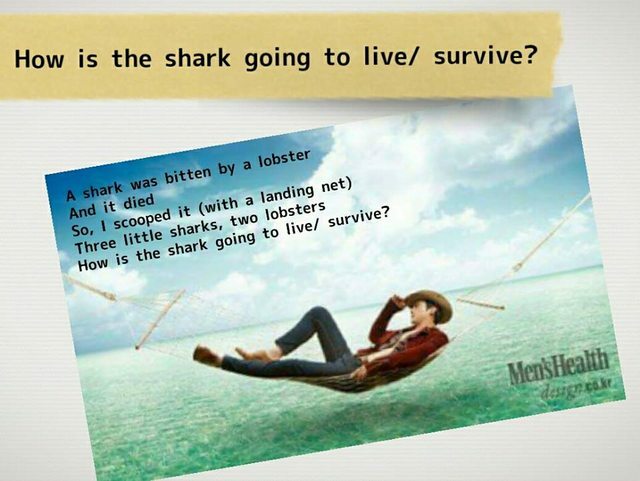 How is the shark going to live/ survive? The shark song was the funniest and tickled a lot of his fans. What an adorable song composer!!! One hour interview with LSW, a warm and sincere interview. Although he posted a lot with different postures, his best charm is his megawatt smile, his healthy and sunshine image. After FOTG, this is his second interview with SURE. During the interview, he used a lot of " BUT ", very sincere but cautiously choosing his wording. One line that impacted the interviewer was " Just like work, I do not want to let myself slow or cool down ". Impression of LSW after three years " Still very shy like before " LSW is very comfortable with this shooting, although he mentioned it seems like a long time ago. Q 1 : After Glorious Days, how did you spent your time ? A: I was planning to go to the USA for two months, rent a car and drive around myself.Somehow did not work out, as I had participated in a few dramas, but end up not shown on TV.If it is not on TV, that means people thought I have no work. I spent time with my family and friends, did not have to worry about drinking too much and getting up next day as there were no schedule. Q 2 : How was the Japanese fans meeting ? A : I did some singing, talked a lot. As for dancing, I still have some difficulty. Actually I did spent a lot of time practicing, don't know why ( maybe I am lazy or lack talent ), cannot do all I want to do. Q 3 : You joined HS as a special guest, it has the same director and writer for your previous drama OWW, did it bring back fond memories ? A : Writer and the director are the same. Writer can portray characters very realistically and in depth. My character in HS is like that, very direct. I find it very interesting in shooting OWW. As for HS, they offered me a special guest appearance, the timing is just before my next drama, so I have no reason to refuse. Q 4 : In OWW, your character is quite unlikable/annoying, people might want to switch to another TV channel. What is your expectation of this character ? A : Acting wise is quite difficult and challenging. Basically I need to make changes to my regular character . First half of the drama is pretty good, I get to look after the female lead in the drama. In reality, the result came out pretty good. After that I received quite a few offers with similar type of character portrayal. Q 5 : In Glorious Day by comparison, your character seems to be pretty boring ? A : After OWW, I decided to rest, but somehow ran right into production of Glorious Day. The shooting was very unstable or up and down. I felt I did not prepare myself well enough. It is not because I did not feel I do these kind of character so often. After that I decided to take a rest. Q 6 : Before all your dramas female lead are a bit older( compared to HS ), how do you feel ? A : If I am acting with sunbae ( my senior ), I still feel I am very green. Then I should look after the junior to have good rapport. Looking at my age and becoming the sunbae ( to the junior ), the process seems a bit slow, still feel unfamiliar. Q 7 : In recent Kdramas or movies, what characters would you like to try out ? A : I saw " Mad Max " recently, seems like one of the most entertaining movies I have seen. I have thought if I am in this movie, which character can I portray. The director has to be very careful and cautious in all his calculation, if it happens to be me, how would I direct this movie. I have these kind of thoughts. Q 8 : Are you passionate about portraying Macho character ? A : No. I don't have those kind of passion. But any character that I have not tried before, even if it is Macho, I would like to try. If I can act well or satisfactory, I maybe would consider these Macho roles. So far I have not seen any character in a drama which I love to do and relentlessly pursue it. Q 9 : Usually actors would not do that either ? A : Of course. WE have to follow procedures, go though our agency to select dramas. It is because the offers we get are based on the actor's image. The offers that come to me are based on my warm, honest and sincere image and character. Q 10 : Usually doing the same type of character can be troublesome ? A : Now it is not anymore. This is also one of the reason why there is a big gap from my last drama. But the final conclusion is that both paths are pretty good. The previous path if I travel along is still good. If there are any chances of change, then it will also develop / find out my potential of another side of my acting skill. Q 11 : Including all main/supporting roles, you have been in 20 movies/dramas. After all these long years of working, keeping the passion is not easy ? A : If you lose passion for working, that is definitely a no no. You cannot let yourself cool down from working. Ten year ago for my first two movies, because I am a new star I received a lot of attention and interviews. Thinking back, at that time I already realize when is the bubble going to burst and what is really carrying me on ? If slow down or losing passion being passionate and keep on going positively makes people more comfortable. Miraculously I do not want to change, even if it is the same kind of challenge. I still want to strive and do my utmost to go on acting. Q 12 : Lots of people at this age will get married or enter another stage of life. During an interview, you mentioned you saw a little kid, a very cute one. But when it comes to marriage you don't seem to be that enthusiastic ? A : In K dramas I have been married for seven to eight times, in a tuxedo and even walking down the aisle and going through the whole wedding process. SW smiled, I do not have any fantasy or expectation , maybe because I have been married so many times, seems like I don't have any interest in marriage. Q 13 : In real life, do you have any expectation in life ? A : Human tendency should not be black or white, and not ambiguous. In certain area I am very practical. But in other areas I am not so practical. Along with the environment and life experience, I have developed some dreams/wish ( to behold ). Up to now have not altogether accomplished my childhood dreams. Q 14 : What is it you want to behold ? A : Not something that extraordinary. Just simple things like a comfortable washroom with folded white towels. Looking back at what I have right now, this is not something that I can have as a child in a regular household. Q 15 : Anything that you cannot control ? A : In shooting a drama, sometimes I feel like smoking. Actually I think I should quit. And playing certain games which can be addictive, but I can always stop playing. Most of the time I can control or am in control. Q 16 : From 20 years old to 30 year old, then to 40 years old, would your focal point be quite different ? A : Going through 30 years old is quite important. Before I like to hang around friends and play ball, leading a free and leisurely life. Now I am afraid of camera closing in on me, among strangers I would be embarrassed. So every time when I finish shooting, I would go straight to my friends. At that time I had an opportunity to take part in First Wives Club, because of this drama, it became the changing point in my life. Q 17 : You are a really shy person, previously you are even more so. In reality are you that kind of person ? A : My work does not allow me to be like that. All my experiences indeed is a blessing to me. At that time, there was a sunbae ( my senior ) who during his spare time always come to the waiting to shoot room. For the whole nine to ten months, he would read and study his script and also help and teach me. I learned a lot of acting from him. Words cannot express my gratitude towards him. Q 18 : In next few year of your thirties, what do you plan to do ? A : Haven't thought about it. I really have no particular plans. I prefer to go naturally with the flow. Q 19 : Besides work, what do you like to do that makes you excited ? A : Something like " segway ", maybe only for a short while, riding it with my cap and sunglasses. Q 20 : Your next drama ? A : I am still deciding on my next drama. Once I made up my mind, will go straight to the production. This is an hour long interview, so many questions were asked, Hope everyone enjoys the article , happy reading ! Apart from establishing his acting career he has started 2 businesses in the last few years. The first is an online shopping mall ~ woozplz ~ selling beauty products with a natural proposition. His business partner is famous Cultwo Show DJ; Jung Chan Woo. Not only Jung Chan Woo is a business partner, he is also a very close friend of Lee Sang Woo and speaks very fondly of him.. Jung Chan Woo once said in one of his shows, "Lee Sang Woo gets really funny when he gets drunk. He gets ridiculously funny." 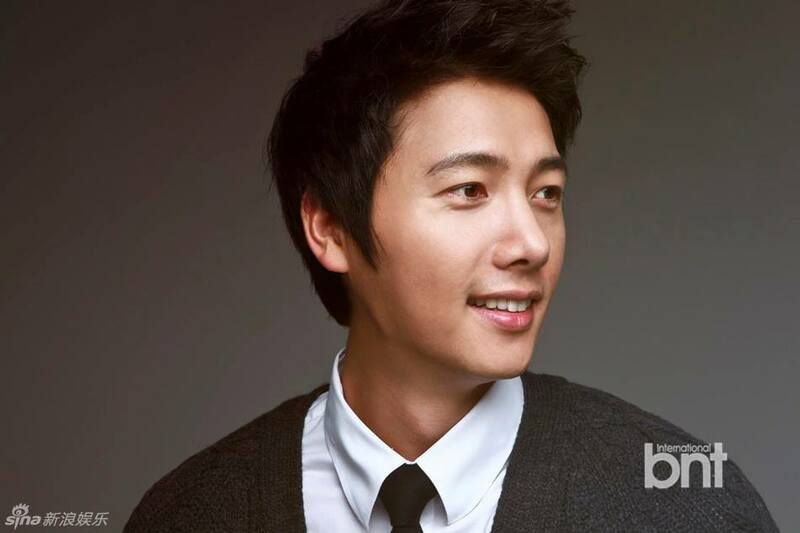 He also said, "Lee Sang Woo is one of the nicest guys that I've ever seen. He manages an online shopping mall, and he packs every items himself. He's so gentle and humble." 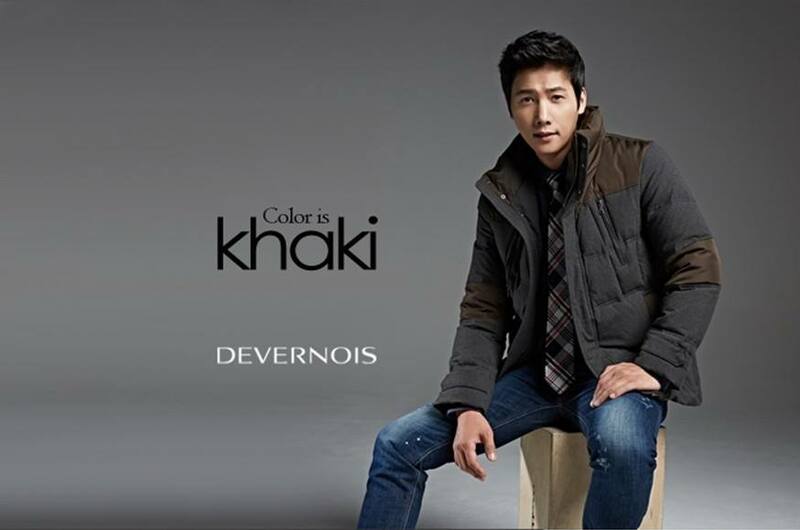 Lee Sang Woo started his second business in early 2015 ~ evanchris ~ that sells men's underwear. Now he has covered both male and female market!! . evanchris has a very interesting proposition - ergonomic design that keeps your skin cool to help maintain the ideal temperature of 33.5 degree. Here are website links for you to learn more and if you wish to shop for the products. he's cute.. but did he appear in 1829? which character did he play? I like his character in 18 29 which is currently showing on KBFD on Fri. & Sat. nights. MAy i call u Mrs2Woo..? Vicodin.. I LOVE this guy!!! He was so cute/hot in 18:29!! Dramas: 18:29 (2005), Was in 2 episodes of "Old Miss Diaries", In an one-off drama "Nobody Loves me"
OOHHH!!! he's the mute one!